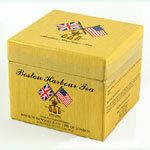 Boston Harbour tea packaged with a white ceramic mug. 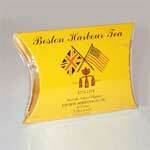 On the front of the mug are crossed flags of the US and England and the words, �Boston Harbour Tea. 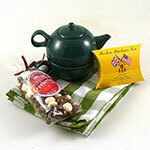 The Firm that supplied tea for the historic Boston tea parties. 1773-1774.� Pillow includes five bags of Boston Harbor Tea. Boston Harbour Tea by Davison Newman & Company Ltd., founded in 1650 and whose Fine Tea was thrown into the water of Boston Harbour by Persons disguised as Indians in defiance of the Policies of His Majesty King George III.